Owner Dwight Boris takes pride in his work, just as he did as a US Marine servicing helicopters as an avionics and electronics expert. His dedication to duty and precise technical proficiency ensures that when he and his crew work on your commercial kitchen equipment, they do the job right the first time to make sure your operation stays running smoothly and your equipment performs flawlessly. After his time in the US Marine Corps, Dwight began working as a field service technician for a large Philadelphia-based food equipment service company. Dwight quickly became the company Technical Trainer, Field Service Supervisor and Branch Manager. Dwight’s experience and know-how gained in those capacities led him to establish Commercial Kitchen Repairs, Inc. on August 10th, 1999. 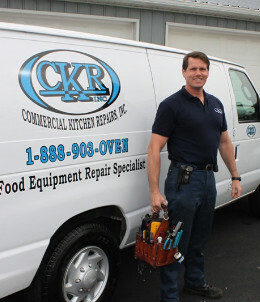 Commercial Kitchen Repair is an efficiently run business with a particular emphasis on customer service; we treat our customers the same way we would like to be treated. Call us TODAY at 1-888-903-OVEN for immediate attention to your commercial kitchen needs.